Short Line railroads (officially called Class III in the United States) are small, often locally-owned operations that provide rail services to locations larger railroads deem of marginal profitability. Short Lines enjoyed a growth burst during the latter 19th and early 20th centuries 1) when larger railroads concentrated their efforts on long runs, and 2) before roads/trucks began hauling freight short distances. 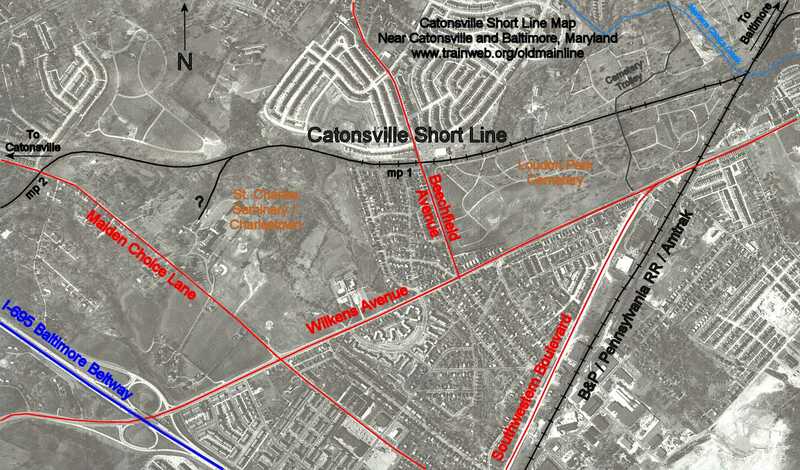 The Catonsville Short Line (CSL) began service in 1884 in fairly typical fashion for Short Lines, shuttling both people and freight between a town and a mainline station or two. It served the center of Catonsville, Maryland located a few miles from the mainline tracks of the Baltimore and Potomac (later Pennsylvania) Railroad. Within a few decades the CSL succumbed to competition from nearby streetcar lines, was sold, reorganized in 1945 as the Caton & Loudon (C&L), and finally ended operation in 1972. 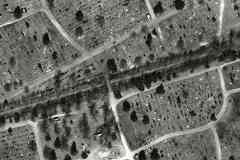 Except as noted, arial photos courtesy Johns Hopkins University. This tour progresses generally west (left) from Amtrak's Northeast Corridor on the right. 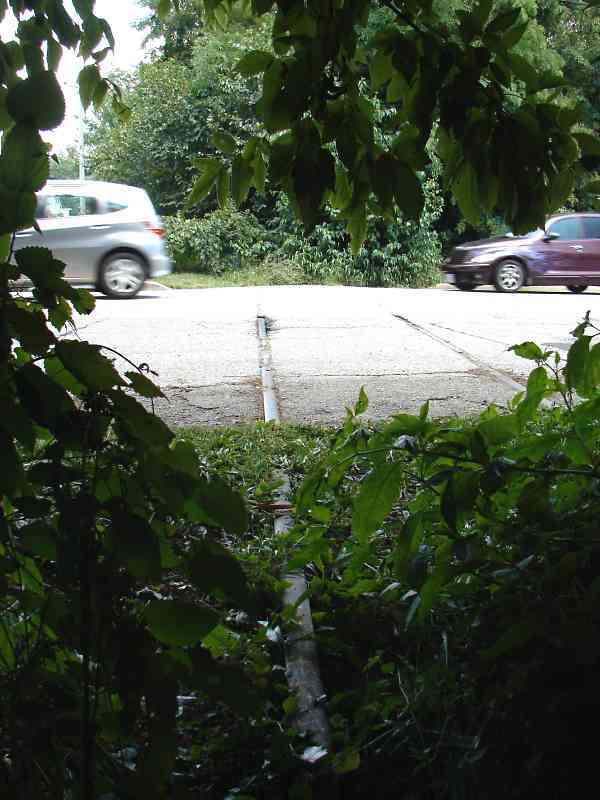 Black lines trace various railroad alignments; where they lack perpendicular lines rails had previously existed but are no longer extant as of 2015. The route of the Loudon Park Cemetery Trolley is speculative since only one artifact was located. 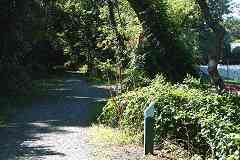 Mp 1 and mp 2 indicate distance into the branch in miles, no actual mileposts were found extant. 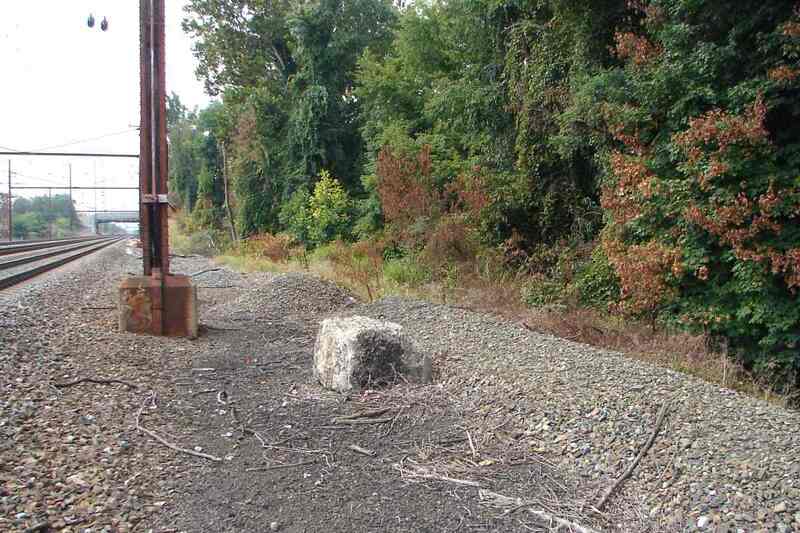 The CSL had met the Baltimore & Potomac Railroad, later Pennsylvania and now Amtrak's Northeast Corridor, here, or more precisely at the boulder between the end of the train on the right and the tuscan red equipment box. Some CSL trains -- I doubt many -- would follow the B&P/Penn tracks all the way to Calvert Station at the intersection of Calvert and Frankin Streets in Baltimore. To get there trains would have to trek 5 miles east of here and run past Baltimore's Union/Penn Station. 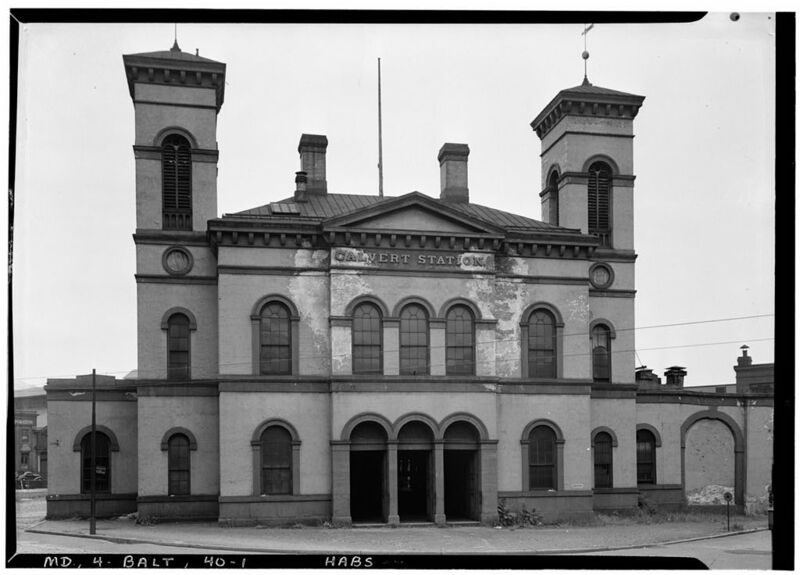 Calvert Station, demolished about 1950, was part of the Northern Central Railway and, like the CSL, under control of the Pennsylvania. In the distance Wilkens Avenue, MD 372, bridges overhead. 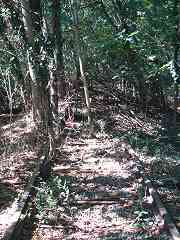 The elevation dip of the rails at the boulder marks where Maidens Choice Creek is spanned; for future reference note both it and the equipment box. 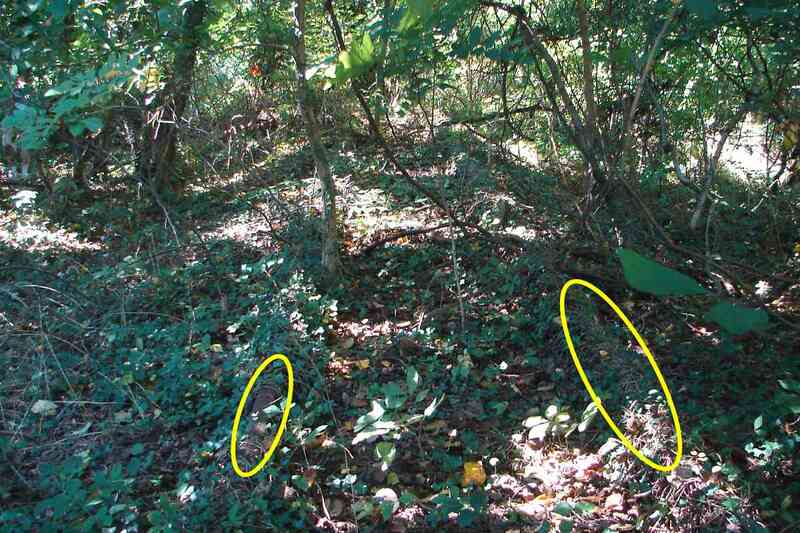 Evidence as presented below indicates the CSL and B&P shared a small passenger station/stop in this area. 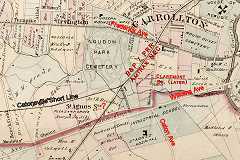 E. Robinson's 1882 map of The City of Baltimore and Vicinity places the B&P's St. Agnes Station southwest of the CSL's junction, likely too far for it to have served as a shared station. On the map different colors depict different owners of adjacent land parcels. Unfortunately the map leaves ambiguous which of the small squares represents the station. The overlaid red question mark and arrows suggest two candidates. Though more distant from the "St. Agnes Sta." 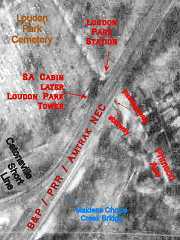 map label, the building southeast of the tracks seems the more logical of the candidates since it is adjacent to both the railroad and road. Additionally that square sits atop the same color land as surrounds the railroad tracks, suggesting railroad property. 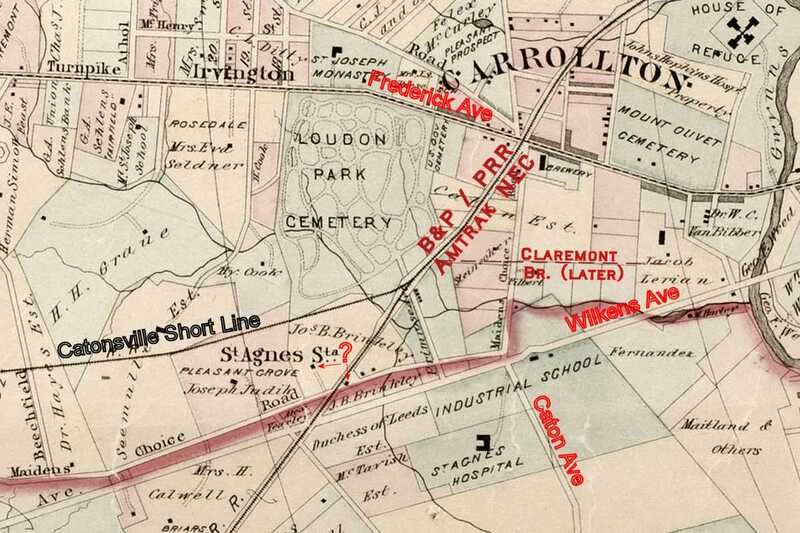 During years following this map, Joseph Brinkley's property would be added to the cemetery, and Maidens Choice Road would be erased, its traffic shifted to the newer and straighter Wilkens Avenue. Polk's Baltimore Maryland City business directory of 1906 describes it, "LOUDON PARK STATION (B&P RR), SE side of Loudon Park Cemetery." 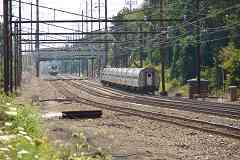 Loudon Park Station was one of three B&P structures on the northwest side of the main line tracks between the CSL and the Claremont Branch. The largest structure was SA Cabin, later named Loudon Park Tower, southwest of a passageway under the tracks that connected Primson Avenue with the cemetery. Loudon Park Station, little more than a waiting shack, sat north of the passageway. 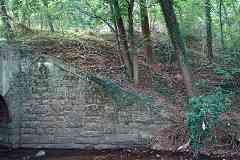 These cut stones are remnants of Loudon Park Station, probably part of its foundation, platform, or stairs. 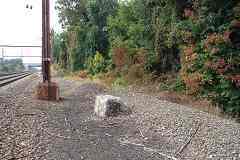 In the cemetery a path of slate pavers leads to this location, but during 2018 Amtrak added fences that block your way to the tracks. 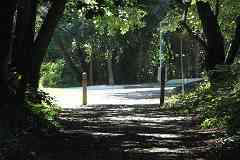 The dark red utility box occupies the site of Loudon Park Tower. 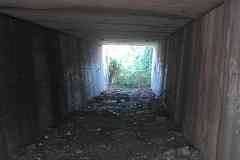 Between the station and tower is the passageway under the tracks. Aerial photos indicate decreasing use of the passage, as evidenced by increasing plant growth, starting during the 1960s. 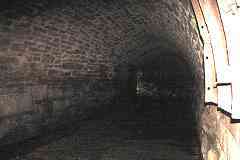 The passageway looks surprisingly modern, lined with concrete rather than cut stone. 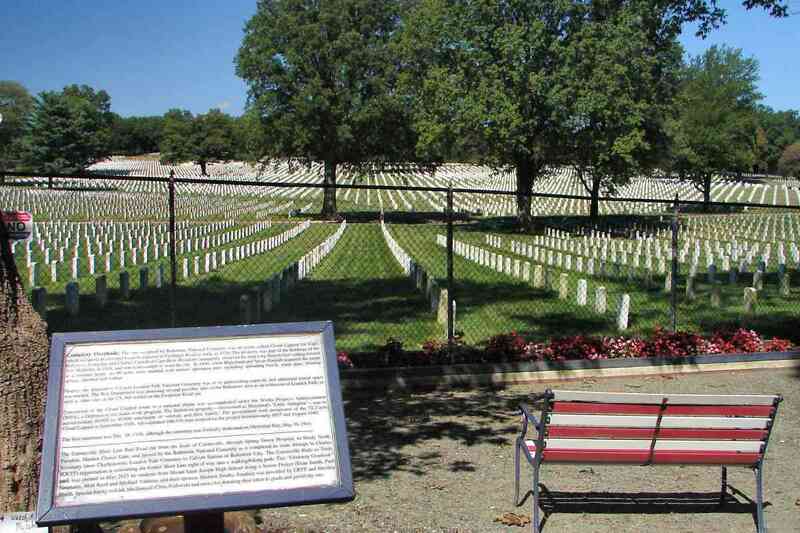 This was a logical place for the CSL and B&P to exchange passengers not only because it is where the two lines met but also because from here people could access both St. Agnes Hospital and Loudon Park Cemetery. 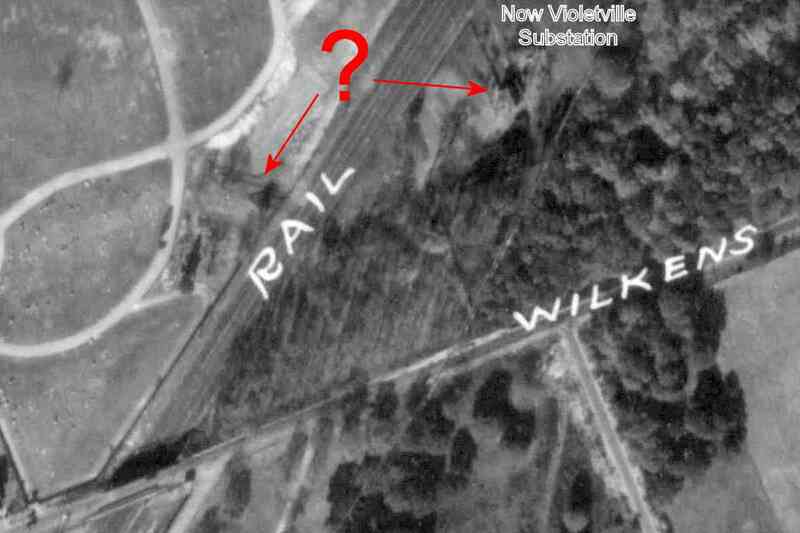 At first glance this 1939 aerial photo by The Baltimore Sun newspaper appears promising but unfortunately is too low a resolution for us to pick out small trackside structures. Even if the stations and stops are inscrutable, the CSL itself is more evident. 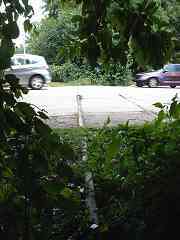 As seen from the tuscan red equipment box, the vague gap in the trees right of the boulder reveals where the CSL had ventured. 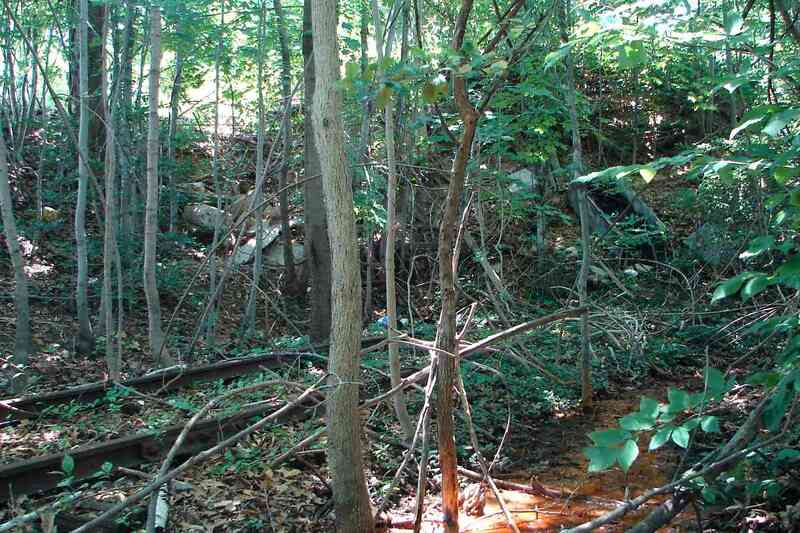 At the right edge of the photo the weeds diminish because Maidens Choice Creek flows below. I believe the boulder is an old Baltimore City boundary marker. 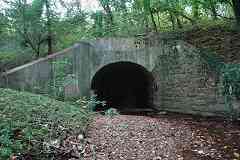 Unlike the B&O's Old Main Line, few original stone arch bridges survive along the Pennsylvania RR's line through central Maryland. This one has been modified multiple times, first widened with stone to support the CSL, and later with concrete to shore up weaknesses. 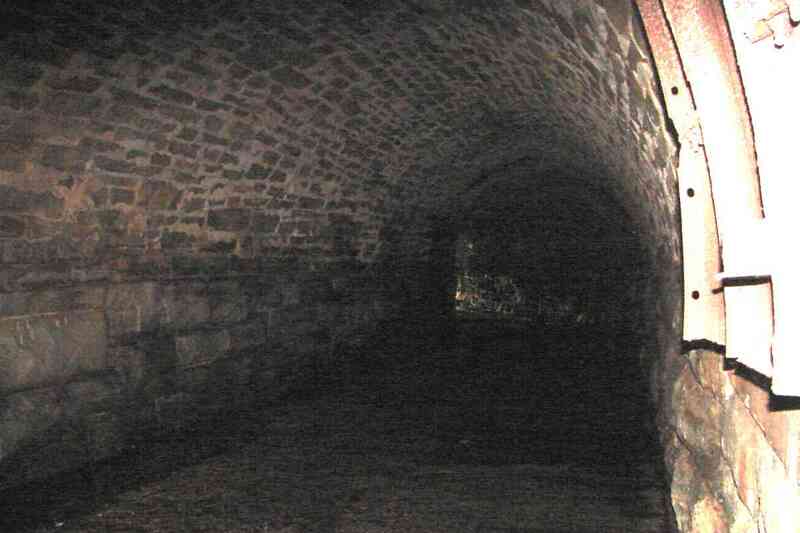 The interior's dog leg and masonry products reveal the extent of modifications during the bridge's more-than-150-year life. 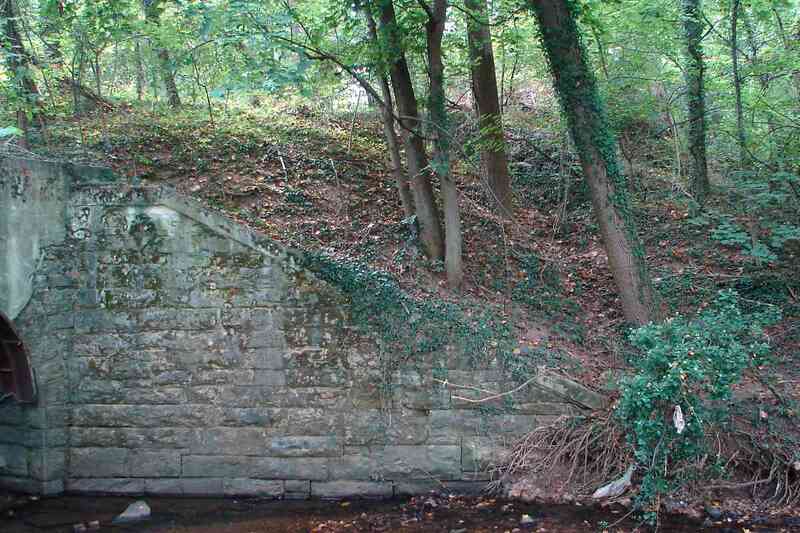 For people dying to get to Catonsville, this mound extending east from the bridge previously led the CSL into Loudon Park Cemetery. 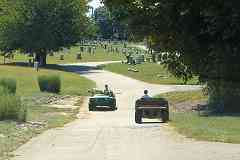 The cemetery opened in 1853 some 30 years before the arrival of the CSL. 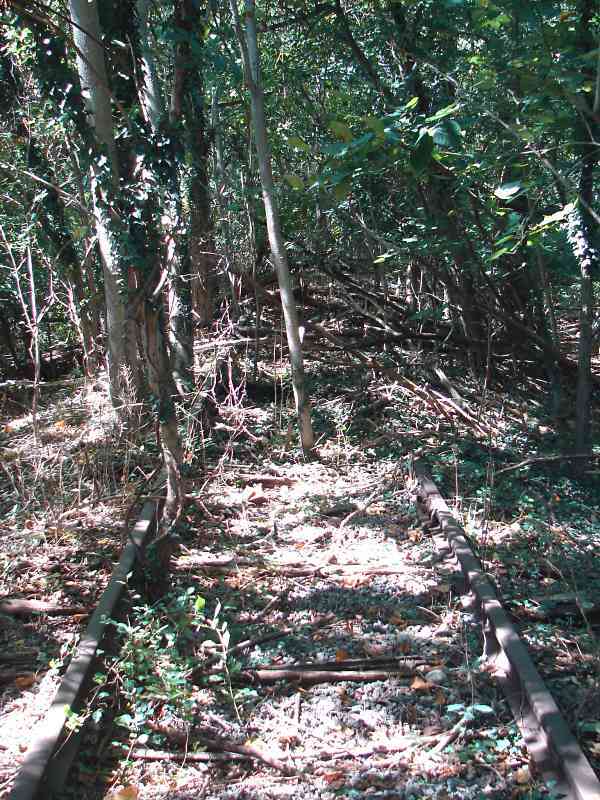 Within a few hundred feet of the bridge the first abandoned rails can be found. 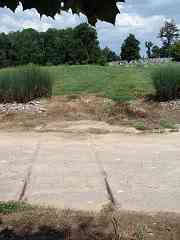 Much of the track through the cemetery has never been, umm, dug up. 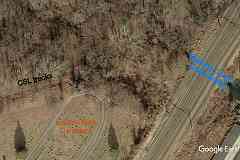 During non-leaf season the CSL's tracks can be seen from way up high, as in this Google aerial from February 2017. These vehicles run errands, and shovels, around the cemetery. The one on the left is crossing CSL track embedded in pavement. Did trains blow their horn for this grade crossing? Those horns are loud enough to wake the dead. The moribund CSL runs into a pile of cemetery discards. Yes, that's a concrete burial vault on the hill. 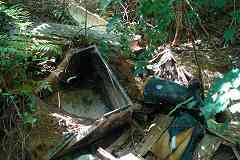 Also scattered about are gravestones, casket interiors, and well, I did not want to look too closely. 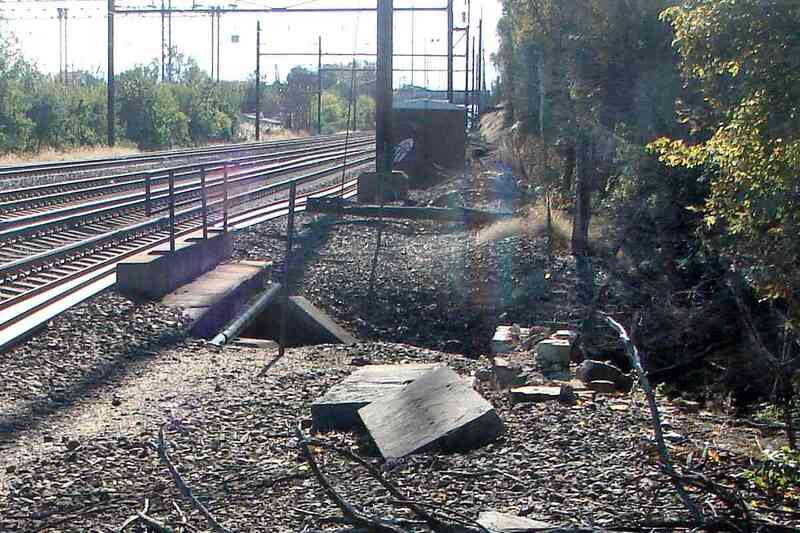 Rusty rails running directly into this detritus will be tough to top on my list of odd trackside sightings. Until the 1970s rather than discards this had been where a bridge carried a different railroad over the CSL. 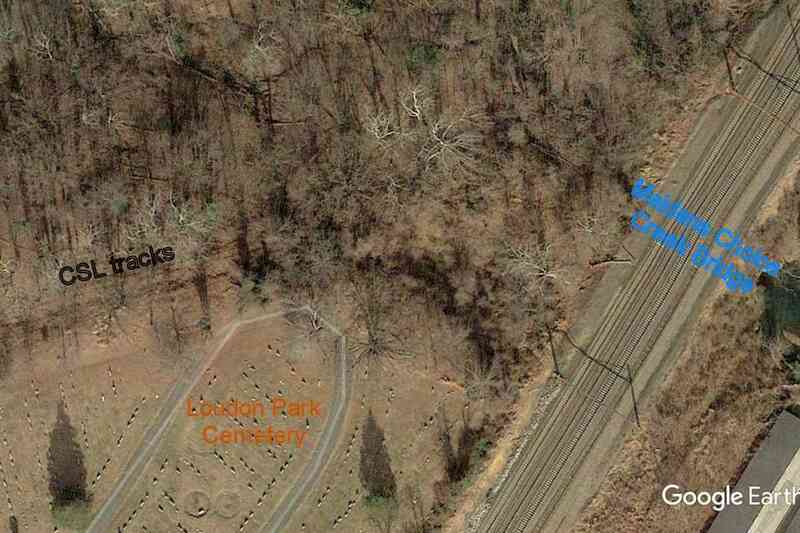 Yes, during the early 20th century one train line was not enough for Loudon Park Cemetery. The other train line was Loudon Park Cemetery's own trolley. 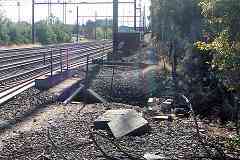 Where it and the CSL met grade separation was required because the trolley was electrified. Now the bridge is being consumed by debris and brush. Drivers turn right and can cross the CSL's rails at the Xing seen previously. The 1971 or 1972 aerial photo at right depicts the bridge before it expired, decades after the trolley had done so. 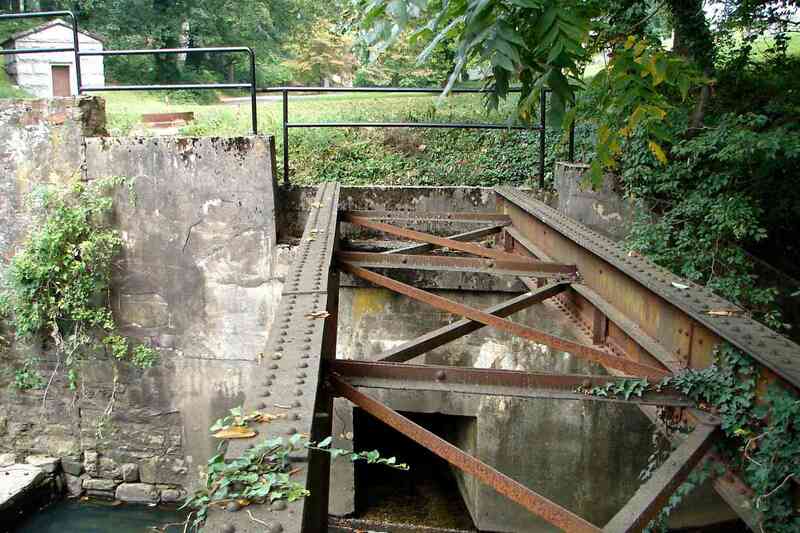 This structure crossing Maidens Choice Creek is the only trolley-specific artifact of the route that connected the cemetery's two main entrances. 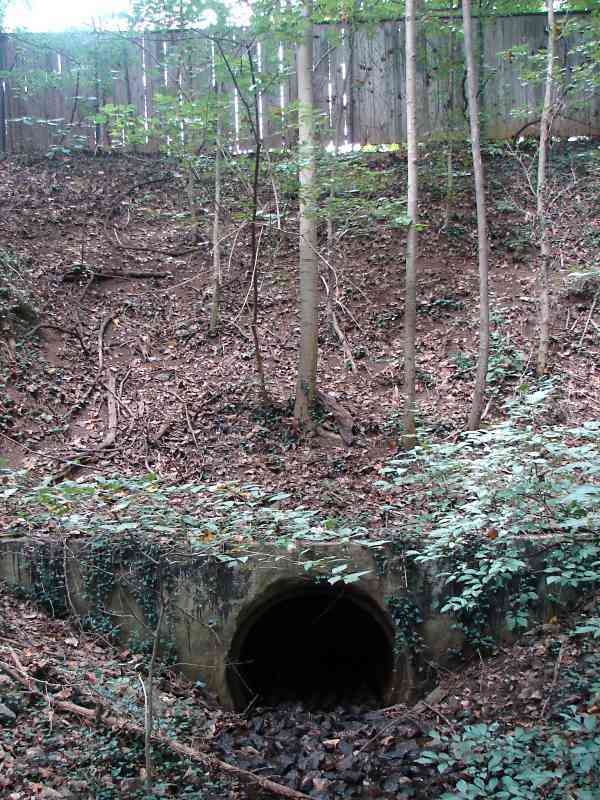 The culvert underneath the bridge represents a stream that was sewered to make way for the trolley above it. The trolley was electric-powered from its 1905 start: note the catenary in the old photo. 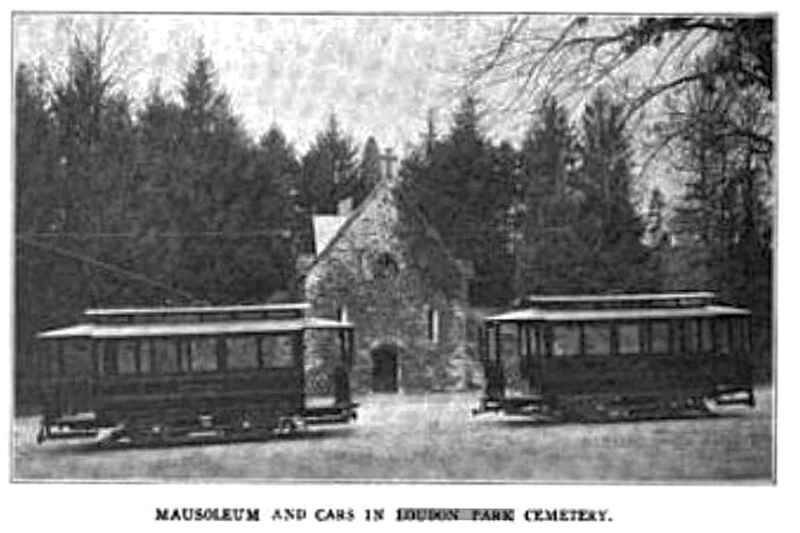 The masoleum in the photo still stands albeit in a state of disrepair. 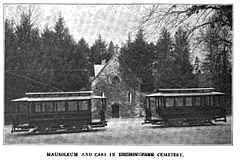 The trolley, with just two cars, named the Linden and Loudon, endured until the plug was pulled during 1931. 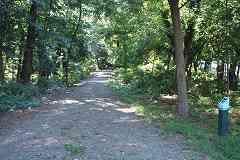 Other trolleys, such as the #8 Line, plied city streets to bring both mourners and corpses to the cemetery's Frederick Road entrance. Beyond the trolley crossing about a quarter-mile of CSL appears to be track-free, though the rails might merely be buried. 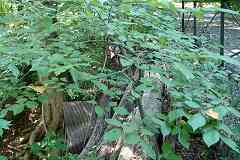 Within the next forested section decaying wood ties are pushing up not daisies but rather new lumber. 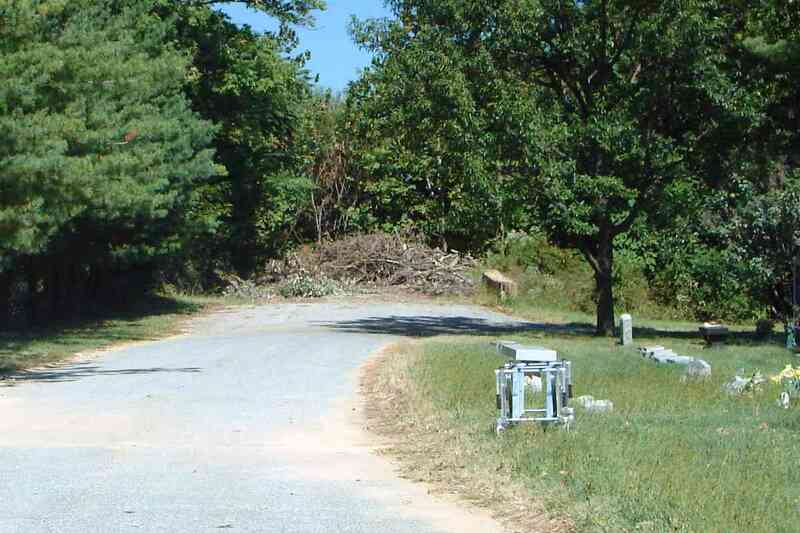 Remnants of the CSL still share a grade crossing with Beechfield Avenue, the western edge of the cemetery. 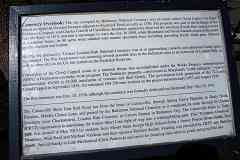 In 1983 the Charlestown retirement community replaced the St. Charles College Seminary that closed during 1977. 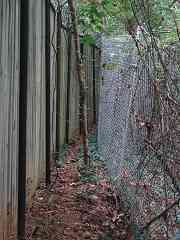 The CSL marks the northern edge of both, its right-of-way now fenced as if a narrow demilitarized zone. No rails remain along this stretch. A little distance ahead a short spur had peeled off to serve the seminary, bringing coal to its powerhouse, and even a church organ via two flatcars. 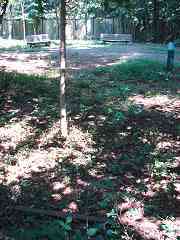 The spur is marked with a ? on the map because I am uncertain of its exact location. 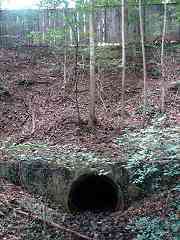 The other end of this CSL culvert is within Charlestown's walled-off confines. Has anyone seen The Shawshank Redemption? 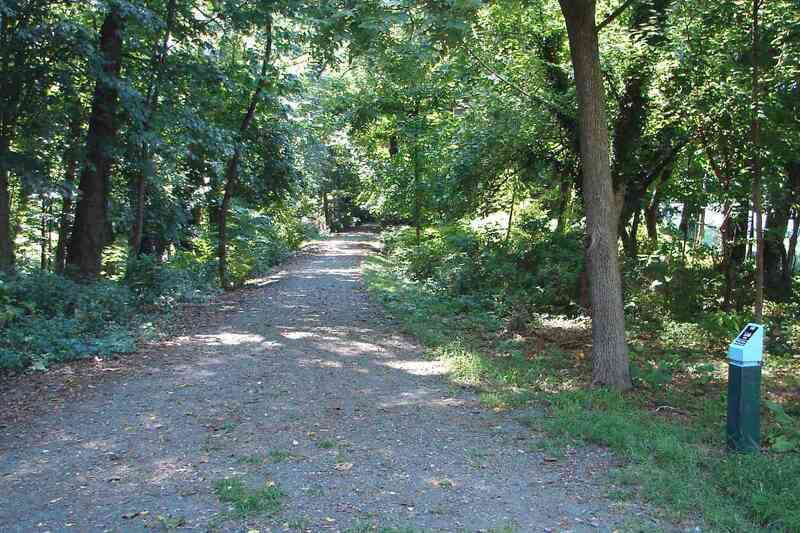 As we proceed west eventually we meet the east end of the Catonsville Short Line Trail, a project of the non-profit Catonsville Rails to Trails group. Charlestown's fence lurks behind benches that have been installed. 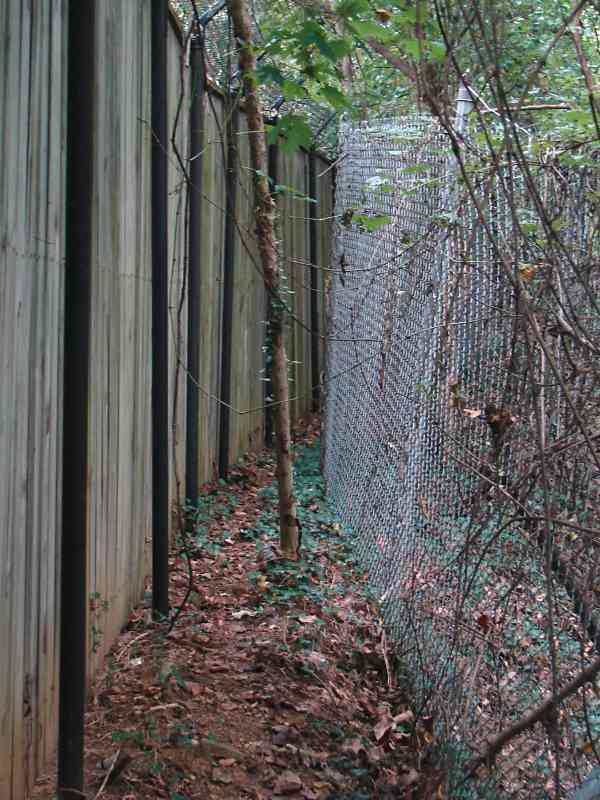 The fence traces the route of the spur used to transport coal to the seminary's power house (off photo on the right) during the pre-Charlestown era. 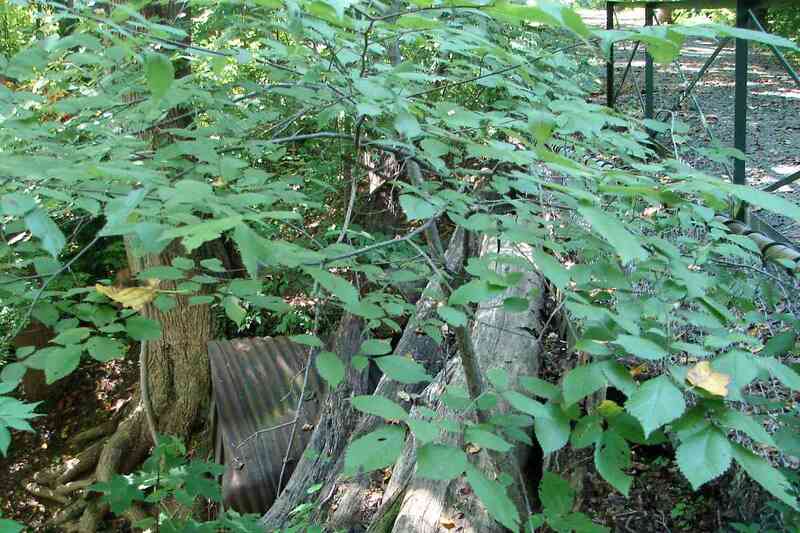 Though the group salvaged CSL leftovers, a few artifacts escaped their attention, such as the rusty rail at photo bottom. 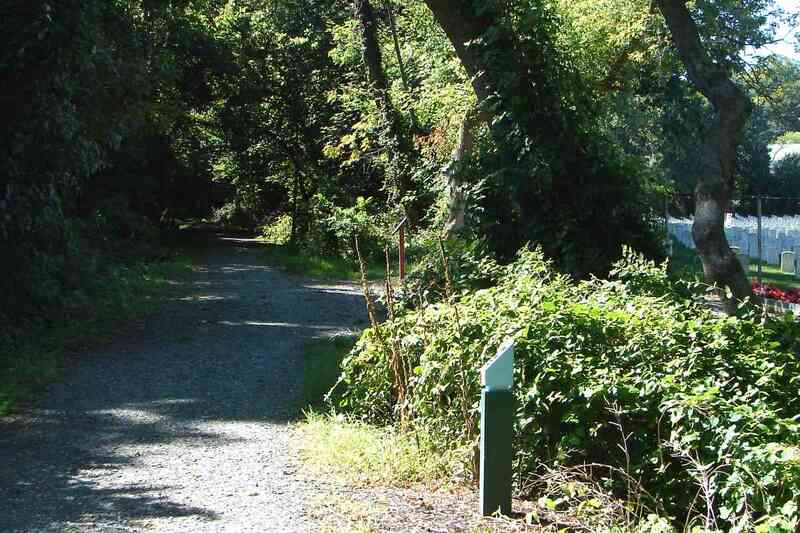 Crushed stone is an appropriate walking surface. Peek around the green fence (right) and you'll find whatever culvert style the CSL had initially used here -- probably similar to the one at Charlestown -- has been replaced by a more modern version (bottom left). 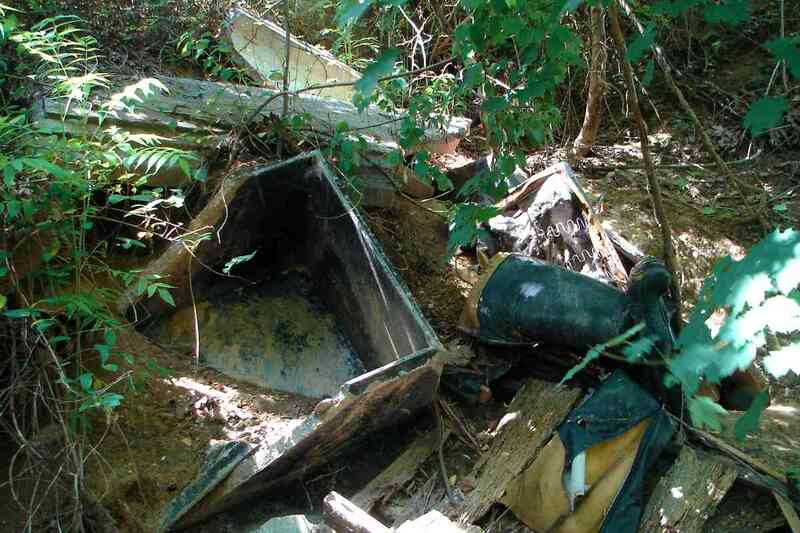 One report online says it dates to 1967 though it appears newer. Red, white, and blue (and green). 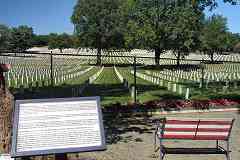 The Baltimore National Cemetery is a Federal cemetery built during the 1930s by the Works Progress Administration. 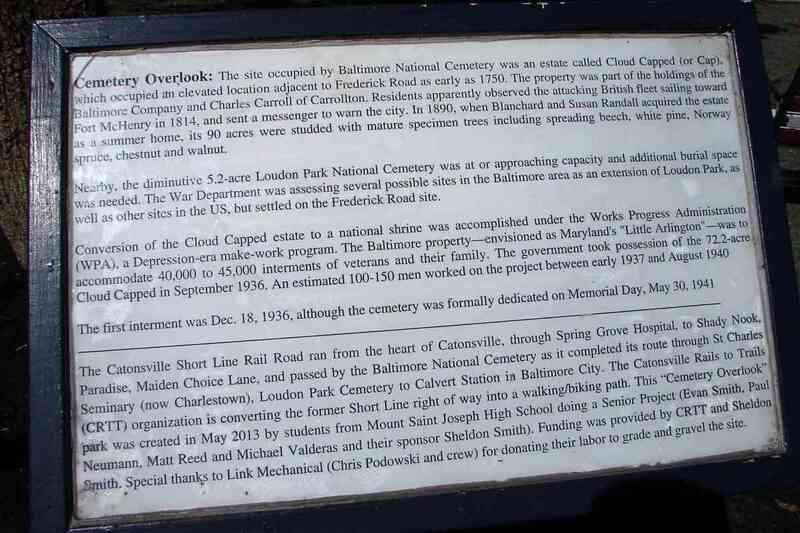 The sign describes the route in a reverse direction to this tour: "The Catonsville Short Line Rail Road ran from the heart of Catonsville, through Spring Grove Hospital, to Shady Nook, Paradise, Maiden Choice Lane, and passed by the Baltimore National Cemetery as it completed its route through St. Charles Seminary (now Charlestown), Loudon Park Cemetery, to Calvert Station in Baltimore City. 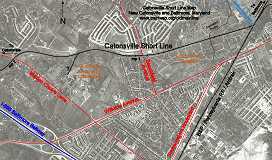 The Catonsville Rails to Trails (CRTT) organization is converting the former Short Line right of way into a walking/biking path. This 'Cemetery Overlook' park was created in May 2013 by students from Mount Saint Joseph High School doing a senior project (Evan Smith, Paul Neumann, Matt Reed and Michael Valderas and their sponsor Sheldon Smith). 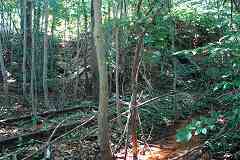 Funding was provided by CRTT and Sheldon Smith. 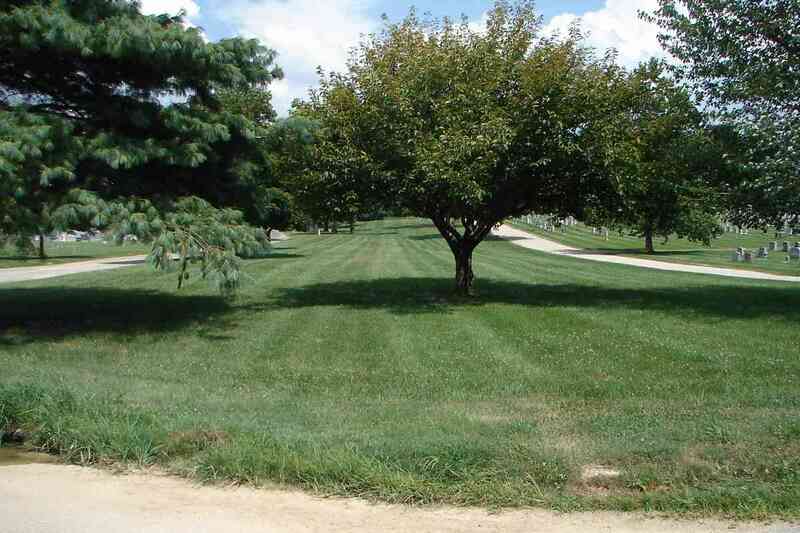 Special thanks to Link Mechanical (Chris Podowski and crew) for donating their labor to grade and gravel the site."